One of CPNI’s first completed projects was the Town of Windsor. CPNI was requested by the Town of Windsor, NC to compile a team of experts in development, design and construction to help them evaluate and develop a comprehensive strategy to better utilize existing buildings as part of the NCSTEP Program established by the NC Rural Economic Development Center is May of 2011. 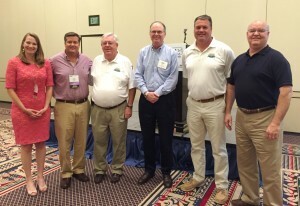 On Saturday, April 18, 2015, Allen Castelloe, Windsor Town Administrator and Billy Smithwick, Marketing Tourism and Fire Chief, attended the CPN Annual Conference in Colonial Williamsburg to give an update on the Town of Windsor since CPNI’s original visit. The town of Windsor is making positive strives using the river located in town as a center point. Tourism has picked up thanks to water activities like canoeing. New store fronts have opened up downtown such as a women’s clothing boutique that is selling clothes across the country, a thrift store, and future plans for a classic ice cream shop. The sign at the entrance of town has been redone and is more visually appealing. And the tv show tree house masters has future plans to film an episode in town. The Town of Windsor has some exciting future plans in the making – we can’t wait for the next update!